"I love the way my house came out and I love the workmanship. John worked very well with my architect who is based in Canada and there was a lot of teamwork in the way the house emerged. John's crew and his subcontractors were a talented bunch and were a pleasure to work with. 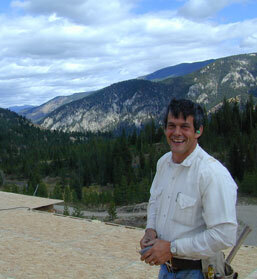 It was very important that the environment around the house be preserved and John did not lose a single aspen tree." 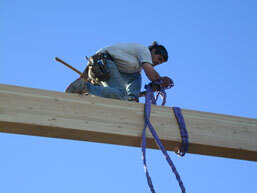 After attending Oberlin College, John entered the building trades as a finish carpenter, cabinet maker and remodeler. He founded his company in 1987. In 1991 he moved to the Gallatin Valley to marry the love of his life, Christina. They have found the Gallatin Valley to be the perfect place to raise their kids: Ian, Matt, Nate, Meghan and Rebecca. Their family is very involved in 4-H and sustainable agriculture. They raise chickens, pigs, sheep, cows and horses. Giving back to the world is important to John and has led him to volunteer for Habitat for Humanity, The Help Center, Sack’s of Bozeman and the Gallatin County 4-H Horse program. He also acts as a consultant to the Foundation for the Preservation of American Indian Arts and Culture. This sense of concern is seen in John’s management technique which supports the company’s respectful and positive working environment and attracts employees of the highest caliber.